Let’s begin here so you know what I’m referring to when discussing a certain part of the guitar. 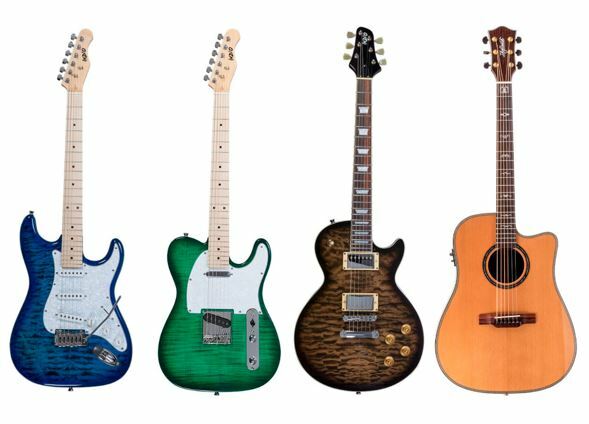 Your Indio and Idyllwild guitars are always shipped ready to play, to ensure that your instrument is dialed in and stage ready. However, your guitar is made out of wood. Wood is very susceptible to expansion and contraction due to things like temperature, humidity, and elevation. There is a small chance that your instrument may flex a little between shipping from our Southern California or Kentucky warehouse to your house in Eastport, ME, Branson MO, Denver, CO or anywhere in the world. There is usually nothing wrong with the guitar, it has simply adjusted to the environment. We will cover some very simple procedures (some less simple) that you can do with common tools to ensure your guitar plays to your liking. Contact your local music store for any procedures that you are uncomfortable doing. Each of these tasks can be done for around $40 or less. High Action-Under bow is caused by the neck having too much bow making strings too difficult to fret. Guitar notes can also become out of tune because the string is traveling too far to make contact with the fret board. If your guitar is not playing right it is best to start with a fresh set of strings. As strings age they become “out of round” meaning they are no longer perfectly cylindrical and have flat spots that do not oscillate properly. New strings also give a good base to make your adjustment to. a. All California, Retro, and Classic models accept strings from the back of the guitar. b. 66 DLX models are strung through the tailpiece. c. Acoustic guitars use pins to hold the strings in place. Pull string through hole in Tuning Peg. Leave enough slack in the string to allow for 2-3 wraps around the string. Tune guitar to pitch that will be used most. Stretch strings and play for a while so the strings settle in place. Most notable if you change gauge of strings or use a different tuning, also noticeable with climate change. String action is how high off the frets the strings sit. If strings are too low they will buzz against frets, too high makes it difficult to play and may sound out of tune because the string has to travel so far down to the fretboard. We will introduce you to the Truss Rod that reinforces the Neck of the guitar. When your guitar is in standard tuning there is about 100-200 lbs. of pressure pulling on the neck. 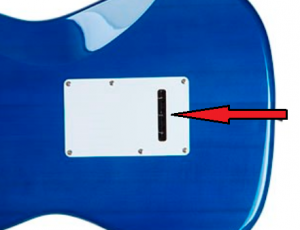 The metal Truss Rod prevents the neck from snapping. The Truss Rod can also be adjusted to relieve or increase the tension so the neck will straiten or bow to your desired playing position. If a single string is not right it may be a simple Bridge adjustment. Use the proper Allen Wrench (included with your new guitar) to adjust the Bridge Saddle higher or lower until desired height it achieved. 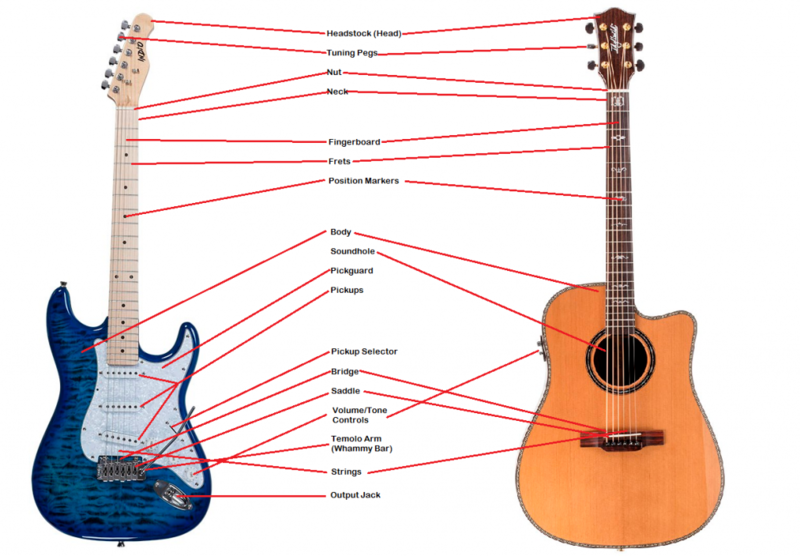 If more than one string needs adjustment then we must look at the neck. Always use caution and make small adjustment at a time as permanent damage can occur if you over adjust. Check string height. We will use “typical” settings, you preference may vary. – 66 Classic and DLX is under a small plate above nut in the headstock. 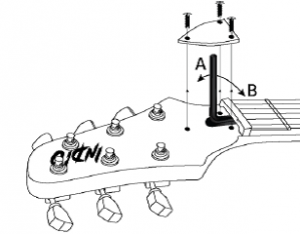 – California & Retro guitars have an opening above the nut in the headstock. – Acoustics Truss Rod is accessible from the Sound hole. – Let the neck settle for about 5 min. – Be sure guitar in in tune again. 3. When your guitar feels just right and there is no buzz or difficulty playing you’ll have a properly set-up guitar! Intonation means the guitar notes are perfectly in tune on all frets up and down the neck. Most noticeable as you play high notes past the 8th fret. Acoustic guitars do not have the means in which to adjust intonation. – Repeat from step 1. until the open string and 12th fret show the exact same tuning. Our California models have 3 springs under the back plate that may need adjustment as you change your string gauge. If you decide to use a heavier gauge string you will see the Bridge pull up from the body a little as you tune the guitar. This will effect action and intonation. This can be a very simple fix. Remove screws to take plate completely off. – If Bridge is still too high repeat step 5. Now that you have a list of some simple things that you can do to ensure your Indio or Idyllwild guitar (or any other guitar) plays at the best of its ability, you should be ready to rock and roll. Of course, there are always exceptions with other styles of guitars. If you are uncomfortable then take a trip to your local music store and have a pro do it. Some music stores have work benches visible so you can see what they are doing and how. Do yourself a favor and ask questions, guitar enthusiast love talking about guitars and what their tricks are for the best sound.